"Everything changes when you start to emit your own frequency rather than absorbing the frequencies around you, when you start imprinting your INTENT in the universe rather than receiving an imprint from existence." 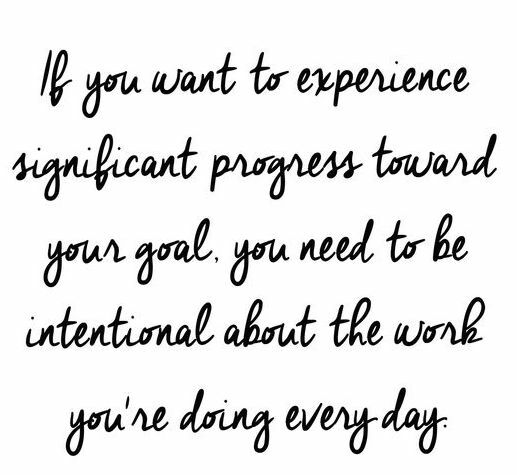 The words "intention" and "goals" maybe used interchangeably in every day life, but in fact, they're quite different. For so long, I have been a goal-driven and action-oriented person, running from one goal to another, Having this energy is all good, except it was not channeled to serve my own truth. Most of my goals were driven by conditioned mind imprint , and what I was expected to achieve, I also had the impression that the more goals the merrier, and living is about being always in action. My energy was not aligned with what I truly long to be or accomplish. The manifestation did not spring from the essence of what really aligns with what I really want. A goal can be simply described as a desired outcome. It is a built up desire and end result that you don't have yet. It is manifested as a result of conditioned mind about a problem needs solving, or about a belief that force you to accomplish. Emotional responses that are triggered by those thoughts then often govern your decision in setting your goal. Let's take an example. You may think that your gym workout need a lot of work, so you set a goal to increase the number of your weight training , perhaps add acrobat yoga classes? or push yourself to do more cardio classes. while this is great and might sound as aspiring goals to have, it's not really an intention. Intention work is powerful, and an integral part of any form of energy and healing. Setting an intention is what sparks a dream to life, and puts in a motion a co-creative process between you and the Universe to move forward in your own evolution. You can think of intention as your energetic source in it's purest form for your goal. It's that powerfully authentic vow that comes from your deep core. It goes deeper than the mind and comes from a state of pure consciousness. Usually the best way to tune in to your truest intention is to meditate, or go on solitude. An intention maybe disclosed to you in the simplest ways as "I will breathe fully" , or " I want to feel light". It may also be more emotional than physical like "I release all my fears", "I embrace my vulnerability" . In the case above about gym workout, I believe your intention would be "to be fit and healthy". What really sets an intention apart from a goal is how an intention soars from a place of presence, a place of love not fear. Whereas a goal is a future projection of the mind. With an intention, you embody your authenticity in the current moment and keep it with you for as long as you need it, With a goal, on the other hand, you have to use your min and relies on reasoning and logic. It create images of what you want your future state of being to look like, which may or may not be a reflection of your authentic truth. Goals has a certain time frame, while intention springs and flows with the process while you may work hard to achieve certain goals that you decide to set for yourself, achieving them won't necessarily keep you satisfied and fulfilled for very long afterward if you didn't set your intention first. Ideally, when you bring yourself to practice and set your intentions(a daily ritual would help this ) the goals would eventually flow in a supported and reinforced by the energy that comes from embodying your intentions. When you are clear on your intentions, your action becomes in alignment with your truth and words. You also quickly manifest what are you are clearly putting out. Embody Visualize the end result. Meditate on it, Write it down. Feel it. Observe the signs The universe is listening. You will notice signs everywhere that relate to your intention. those signs will call you effortlessly and you will see how you start acting upon. Hold your intention. Default to similar happy thoughts Act as though your intention has already come true.Keep imagining the outcome. Trust the Process and realize your manifestation Feel the gratitude and reinforce your trust in the process.